The two days after my whirlwind work-related tour of Madison, WI were spent in all-day staff training. While the training was useful and the staff bonding was valuable, following two days of travel with two days of professional development meant that, by the time Friday arrived and I had a full day back at my desk, my inbox and workload was out of control. It looked like I’d been on vacation for the week, without my having had the fun or the mental break of being on vacation. Therefore, I spent most of Friday answering emails, returning phone calls, and just generally digging myself out after being away for four days. By the time 5pm arrived, I was ready for the weekend. Hubby and I decided to treat ourselves, even though we’ve been eating out less, so we ordered pizza and I opened an Italian red that I was looking forward to trying. 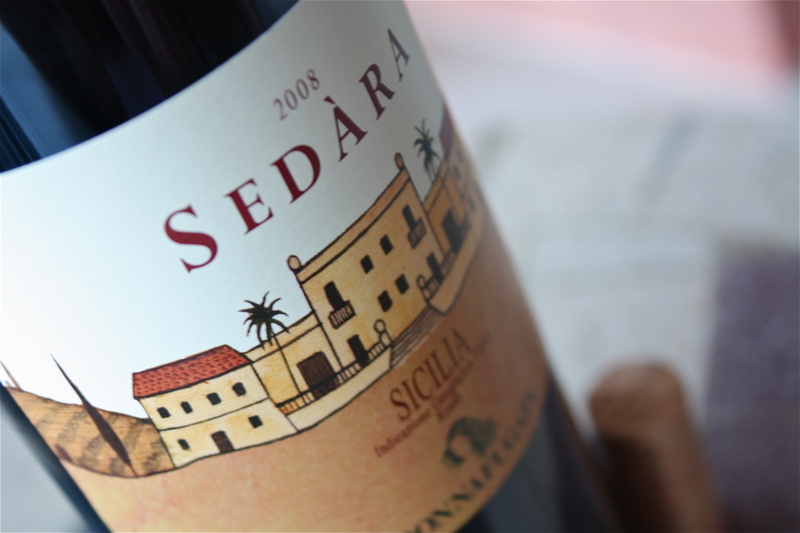 The 2008 Donnafugata Sedàra (winery, snooth) was a blend of Nero d’Avola, Merlot, Cabernet Sauvignon, and Syrah gapes and had a purplish color with hints of ruby. On the nose, there were bright red fruits followed by nutmeg, cinnamon, and rose petals. In the mouth, there were Bing cherries, tart raspberries, unripe strawberries, and a hint of sweet cooking spices. The wine had a biting acidity with a light-to-medium body and low tannins. Is this worth a glass after work? Eh…if you have a bottle on hand, drink it, but I wouldn’t go searching it out either. At $12, this wine isn’t very expensive, but it also isn’t very good. The nose offers the expectation of a smooth, delicious wine filled with red fruit and spices. Instead, the wine delivers a surprising acidity that not only isn’t smooth, but also overpowers the fruit and spice characteristics. Pairing the wine with pepperoni pizza definitely helped take off some of the edge, but not enough to make me want to search this wine out in the future.